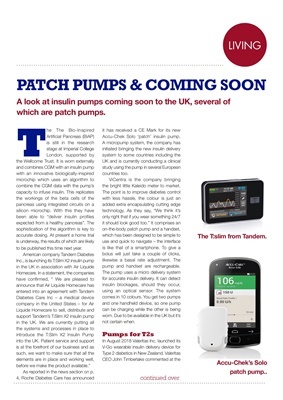 UK, the majority of which are patch pumps. to be published this time next year. before we make the product available." As reported in the news section on p.
something 24/7 it should look good too." - the interface is like that of a smartphone. clicks, likewise a basal rate adjustment. The pump and handset are rechargeable.